In this highly suggestive VIS image, taken by the NASA - Mars Odyssey Orbiter on May, 19th, 2002, and during its 1.897th orbit around the Red Planet, we can see a really small portion of the Floor of the Impact Crater named Proctor. Proctor Crater is a large Impact Crater located in the Noachis Quadrangle of Mars, and centered at about 48� South Latitude and 330,5� West Longitude. Proctor Crater is approx. 168,2 Km (such as about 104,452 miles) in diameter and it was so named after Dr Richard A. Proctor, a British Astronomer (who was born in Chelsea, UK, on March 23, 1837 1837 and died in New Youk City, USA, on September, 12, 1888). The Crater contains an approx. 35 x 65 Km (such as about 21,375 x 40,365 miles) Dark Dunefield and the latter was one of the first Sand Dunefields ever recognized/discovered on Mars based on the NASA - Mariner 9 observations. Just out of curiosity, the aforementioned Crater's Dunes are being almost constantly monitored by the Mars Reconnaissenca Orbiter HiRISE Camera in order to identify possible changes in thier shape and location which might have occurred over time. 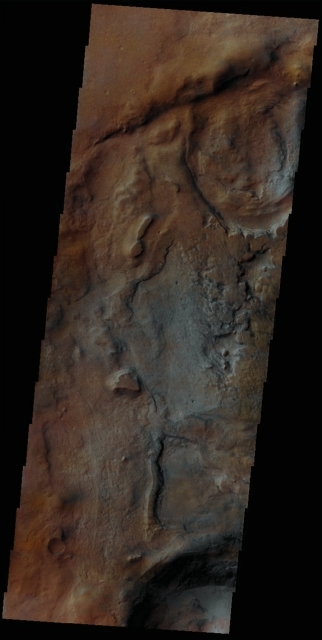 This image (which is an Original Mars Odyssey Orbiter false colors and Map-Projected frame published on the NASA - Planetary Photojournal with the ID n. PIA 18981) has been additionally processed, magnified to aid the visibility of the details, contrast enhanced and sharpened, Gamma corrected and then re-colorized in Absolute Natural Colors (such as the colors that a normal human eye would actually perceive if someone were onboard the NASA - Mars Odyssey Orbiter and then looked down, towards the Surface of Mars), by using an original technique created - and, in time, dramatically improved - by the Lunar Explorer Italia Team.